It’s a growing BTLM tradition to dedicate the last post of the year to a Deceased Eleven line-up; our recognition of some of the wonderful footballing talent that sadly passed away over the past twelve months combined with an exercise in fantasy team building. It’s an ominously strong team for this year with the attacking half looking especially potent. The sheer pace and directness of Eusebio, the movement, flexibility and trickery of Finney and the all-round brilliance and leadership of Di Stefano would drive any defence in the world, from their time or from ours, to distraction. The eleven players selected won nine European Cups between them and appeared for their respective countries 536 times in total. We’ve elected to play our side in a loose 4-2-3-1 formation, though as the late Jock Stein once said, with players of this quality you wouldn’t worry too much about the finer detail – you’d just tell them to go out and play. Read more information about our selections below. Famed for his tremendous agility and catching ability, Beara was the keeper that Lev Yashin told the world in 1963 was the best the game had ever seen. Won seven Yugoslav titles during his career with Hajduk Split and Red Star Belgrade and represented his country at the 1954 and 1958 World Cups. One of Scottish football’s greatest defenders and a player who could have been selected for this team in either full back position. A loyal and long-serving player with Rangers, Jardine played to the age of 40 and enjoyed a fine second-career with Hearts. Twice voted Scotland Player of the Year and played for his country at the World Cups of 1974 and 1978. A right footed left-back with an on-pitch style as flamboyant as his flowing blonde locks. Enjoyed an itinerant career with successful spells at Botafogo, Fluminense and Sao Paulo at home and New York Cosmos and the Fort Lauderdale Strikers in the NASL. Played for Brazil at the 1974 World Cup. This tenacious and hard-working Scottish midfielder spent a decade with Celtic before moving south to join Everton, then notably Leeds United late in his career. Collins was the captain of the early Don Revie side that gained promotion to Division One and became regular contenders for major English and European honours. The first Brazilian to hold the World Cup aloft, Hilderaldo Bellini was a classy and composed central defender and a perfect captain for the fine 1958 team. He participated in his country’s successful defence of the trophy four years later and was part of the squad in England for the 1966 tournament too. Excelled at club level with Vasco da Gama and Sao Paulo. A member of the outstanding Dynamo Kiev team of the mid 1980s, Bal could play with distinction in deeper midfield positions or in central defence where we have selected him. His Kiev career brought four Soviet titles, four Soviet Cups and the 1986 Cup Winners Cup. Represented his country in the World Cups of 1982 and 1986. Although he started Hungary’s famous 6-3 at Wembley on the bench, Sandor was a key member of Hungary’s golden generation of the 1950s. A skilful and direct right-winger, Sandor was both regular creator and scorer for his country and his club, MTK Budapest. Appeared at the World Cups of 1958 and 1962. The heartbeat of Benfica’s hugely successful 60s teams, Coluna added great strength and stamina in the centre of the pitch to complement his technical skills and devastating long-range shooting. His career in Lisbon yielded ten domestic titles, seven domestic Cups and two European Cups. Played for Portugal at the 1966 World Cup. There’s plenty of sensible people out there who will make the case that with the passing of the great Alfredo Di Stefano, football has lost its greatest ever practitioner. To suggest he was a utility man extraordinaire underplays Di Stefano’s genius: this was a man who would invariably be the best in whatever role he chose to play in; the most prolific centre forward, the most creative midfielder, the hardest-tackling defender. We like him best playing behind a main striker giving him the freedom to roam all over the pitch. Another player who without fear of contradiction can be deemed one of the best the game has seen. Eusebio’s explosive striking talent and incredible consistency over a long career produced some incredible figures to complement his quick, direct and elegant style. A scorer of 638 goals in 614 Benfica games, a winner of 16 domestic trophies and twice a European champion. 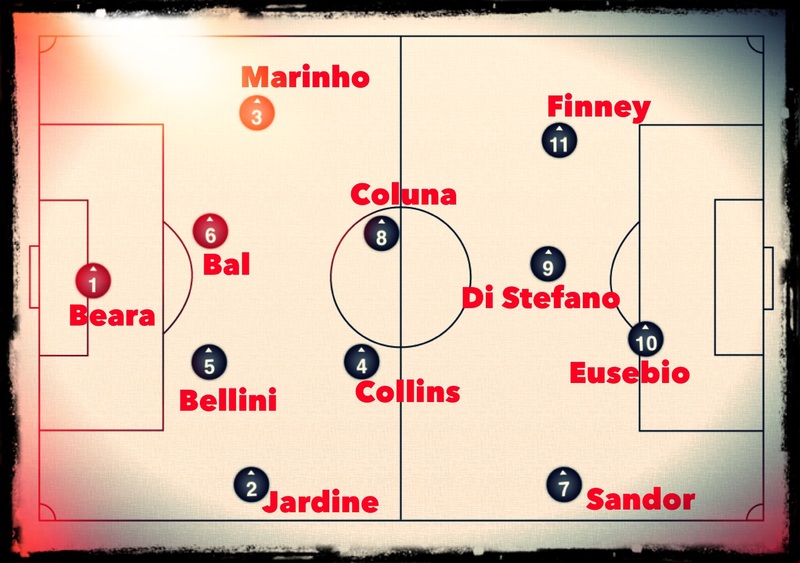 So talented and adaptable are the players selected in the jerseys numbered 9,10 and 11 in this team that we could quite easily rotate the positions of all three and the attack would lose none of its potency. Tom Finney was a forward with a tactical flexibility and range far beyond his English peers. The Preston man could play and score prolifically as a central striker, glide up and down the right touchline leaving bewitched opponents in his wake, or cut inside from the left wing to become a goalscoring inside-forward back in the days when such a tactic was almost unheard of. The Lionel Messi of his day.